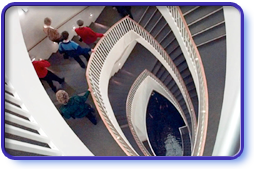 Visitors make their way down the main staircase at Chicago's Museum of Contemporary Art. When this art patron donated her definitive collection of impressionist paintings to the AIC, Chicago suddenly had its first world-class museum. Growing up in post-Columbian Expo Chicago, this animator learned a little about grandiose displays and dreamlike kingdoms. This quirky inventor and faculty member of the Chicago Institute of Design gave us the geodesic dome, among other things. Mixing his Creole roots with the flavors of Bronzeville Chicago, this African American painter cooked up a visual gumbo Chicagoans still love. From his legendary South Side studios, he literally wrote the book on the History of American Sculpture - then added to it with five decades of heroic monuments.